Bear With Me or Bare With Me? The speaker asked the audience to bear with her while she searched for the correct graph. Sorry, until I find the graph you will have to bare with me. Are you still stumped? Here’s an easy way to differentiate bear from bare. You learned that bear as a verb means “to endure.” In its noun form, bear refers to a large furry animal. Combining these two definitions into a silly sentence will help you remember that the correct phrase is “bear with me,” not “bare with me.” A patient bear will always bear with you, but an impatient bear just might devour you! Here are some online examples that use the phrase correctly. If you can bear with me, a protest implies more than opposition, but rather accusation and rejection. Please bear with me for the next few minutes because you are about to read the most self-indulgent column I have ever written – and as I’ve been writing these weekly Wednesday missives for the past 30-odd years, that’s really saying something. “Thanks for ‘bearing ’ with me all these years…. especially my super clever comedy,” he wrote alongside a photo of the two brothers posing with a bear. Bare and bear sound alike so it’s easy to imagine why people confuse the two. Do you have them straight in your mind? 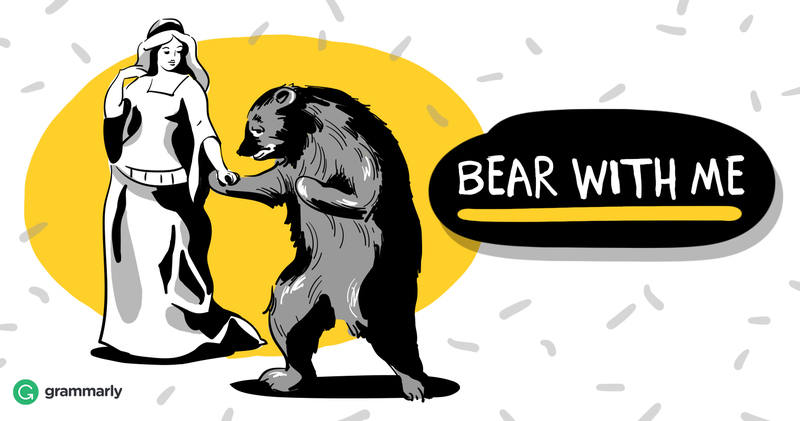 Bare is a verb that means to “to uncover.” However, if you keep in mind that the verb bear means “to endure” or “to be patient,” the expression“bear with me” will make sense. What other homophones would you like to master today? How about starting with discrete and discreet?